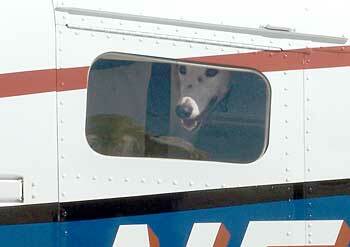 On Monday, February 26, 2007, GALT angels, Michael and Jane Scott, flew three injured Greyhounds and one sick Greyhound from Valley Race Park in Harlingen to Addison Airport so their treatment could begin as soon as possible. Michael and Jane are GALT volunteers who live in Austin. They generously offered to pick up the dogs and bring them to GALT on very short notice. Because of their generosity of spirit (and their time and fuel) the lives of these Greyhounds are already better. RRRRRRRRRROOOOOOOOOOOO to Jane and Michael Scott from all the GALT Greyhounds! Fly, SueBee, Solomon, and Tucker also thank Eddie Estrada and Stephanie LaNoue, GALT volunteers, for getting them to Dr. Ellis' office for evaluation. Those four pups certainly had a big day. 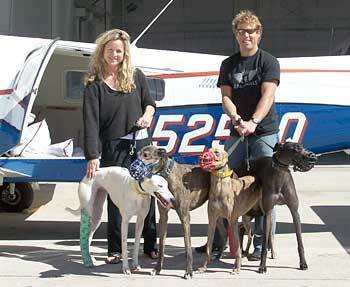 Jane and Michael Scott get all the dogs - Fly, Tucker, SueBee and Solomon - safely on the ground after their first-class plane ride.